I was at a training for Obama Volunteers in September. It was called ‘Camp Obama’ and we were all gathered together in a hall in Brooklyn for two days of intensive instruction on how we could be most effective in the final seven weeks before the general election. Most of us had been volunteers for the Obama Campaign during the primaries and we were asked to explain why, in two minutes or less, we supported the Senator from Illinois with the funny name. The moderator went around the room, and various reasons were heard. College students talked about the struggles they faced with student loans. Lawyers talked about the way in which the American Judicial System has been undermined under the current president. Someone spoke of the American Image around the world and how it has suffered in the past eight years. Someone else spoke about the hardships of growing up in a single parent home. I have always found it difficult to voice out loud with any real eloquence my reasons for doing things, so as the moderator made her way around the room, I was thinking hard. Was it the Iraq War? And even though I had supported John Kerry for president back in 2004, what was it about Barack Obama that had moved me to do things I had never done before in the fourteen years I have lived in this country (get into a car with three strangers at the crack of dawn one Saturday morning last February and drive seven hours to Ohio to canvass for Obama, for example, or trudge through snow up to my knees in boots that leaked for six or seven hours a day, and feel the cold hardly at all). When the moderator finally got to me, I stood up and said that one of the reasons I support Barack Obama for president is because I am from Ireland. I said that growing up in Ireland had instilled in me a sense of fairness. That there is a right way to do things, and a wrong way to do things. I don’t know if it was the Catholic Education – the nuns’ sharp discipline – or, in my own family, the insistence on honesty, generosity, kindness and consideration for others above all else, but there was something that resonated with me about Barack Obama’s message. He understood that government does need to play a role in helping people get ahead, in providing the tools, the access to education, affordable healthcare. And while he is proud to be an American, it is not the kind of pride that is perceived as arrogance in a foreign land. Ultimately, I said, this was a great chance for America. The difference between the two candidates was stark. We were making a decision about the direction in which we would like this country to go. Did we want – and it was a phrase repeated over and over on the campaign trail – ‘four more years of failed Bush policies’ or did we want change – a new kind of change. And that is why I was supporting Barack Obama. We all thought that Hillary Clinton was going to win the Democratic Nomination for the White House. It was, to the point of exasperation, a foregone conclusion. Friends who supported Barack Obama lamented the fact that so much of the political establishment seemed to be endorsing Hillary Clinton, more out of their own self-interest than in the interest of the future of this country. A friend described me as naïve for even thinking that Barack Obama could get close. It was not so much that my friend supported Hillary that frustrated me. He argued that the business association he was a member of would benefit from its support for Hillary Clinton once she became president. I remember our conversation well and thinking that all was futile. Hillary was a shoe-in. Politics was a selfish man’s game. I was in Colombia and I remember thinking, ‘this is good,’ but I was still not convinced that Obama could beat the Clinton Juggernaut, something that was reinforced five days later when he lost New Hampshire. When he was finished we both agreed: this was an extraordinary speech. This was not a concession speech. He wasn’t going down without a fight. Thousands of miles from New York City I was filled with a real sense of the possibilities for America that were encompassed in the candidacy of Barack Obama. I returned to New York in time to vote in the New York Primary on 5 February, or ‘Super Tuesday’ as it is known here – 24 states held primary elections that day and it was widely agreed that Super Tuesday would be the day when Hillary Clinton put an end to the primary season. Barack Obama won both more states and more delegates on Super Tuesday. 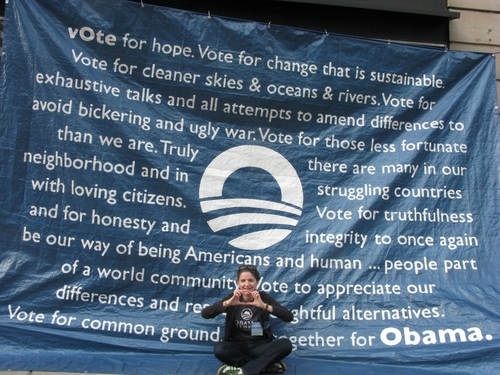 And so began my real involvement in the Barack Obama Campaign. The following weekend I was picked up in the dark hours of dawn on a Saturday morning by people I had never met and we were off to Ohio. That first weekend of canvassing was a blast. Our very first task was to work the line at a rally being headlined by the ‘liberal lion’ from Massachusetts, Senator Ted Kennedy. We were in Akron, Ohio and it was cold but when we got to the event two hours before it was due to start there was already a line forming down the length of the car park. Our job: to get everyone’s information: their name, address, telephone number, email address and whether or not they were willing to volunteer. At the time, Hillary was ahead in Ohio by 20 points, but there were a lot of undecided voters in that line which gave us hope. I met a wonderful lady, probably about 70 or so, who had come to the rally with her daughter. Her daughter supported Barack Obama. She loved the Kennedy family, she felt indebted to them for everything they have done for this country, but she also wanted to live long enough to see a woman in the White House. A dilemma for sure (although not one that I shared!). Later that weekend – it was President’s Day weekend – we got the chance to volunteer at a Barack Obama rally in Youngstown, Ohio. If it had been cold on Saturday, on Monday it was colder than cold. We arrived at the venue at 10am. Barack Obama was due to speak at 2:15p. If you had seen the line you would have thought he was speaking at 11. Again, we were out there, getting everyone’s information, us, along with about 100 other volunteers. Between us we managed to get all of the requisite info from the 6,000 people who had come to hear Barack Obama speak on a sub-zero President’s Day in Youngstown, Ohio. I had the chance to hear Barack Obama speak live four times this year. The first time was that day in Youngstown, Ohio. The second was when he accepted the Democratic nomination for the Presidency at Invesco Mile-High stadium in Denver, Colorado, the third was in October when he made a surprise stop at a Get-Out-The-Vote training in Columbus, Ohio, and the fourth time, perhaps the most audacious, was the Sunday before Election Day when he came to Columbus, and spoke on the steps of the Statehouse. Ohio has always been a tough state for the Democrats. It is described as a bellwether state – the state of average – if you are testing a product you test it in Ohio because that is where the population most reflects average America. The last time Ohio went blue was when Bill Clinton was running for the White House. It is, essentially, a conservative state and so the result here – whether or not Barack Obama won the presidency – would be telling in that it would reflect just how far this country was able to go to rise above the history of its bigoted past. John McCain and Sarah Palin had been blanketing Ohio, describing Obama as a ‘socialist,’ and Palin’s comments about him ‘palling around with terrorists’ were getting a lot of airtime and played on the misinformation that had been going great guns on the internet about Obama’s heritage. When Barack Obama appeared on the steps of the Statehouse on that beautiful sunny afternoon, the first Sunday in November, it was as though he was bringing his army to the gates of America and clanging on the bell. He denounced the politics of divisiveness and fear and promised that we could ‘steer ourselves out of this crisis with a new politics for a new time.’ He repeated the line that moved so many when he made the keynote address at the democratic convention back in 2004. An estimated 60,00 people were in that crowd that day clanging on the bell with Barack Obama. We were all there, asking Americans to listen to their better angels, to rise above this nation’s past and move this country forward. Ohio delivered. 51% to 47%. Our next president certainly has his work cut out for him. Everyone is nervous about the current economic downturn. The country is engaged in two wars and the international stage is volatile to say the least. I have a lot of hope for Barack Obama’s America.